I've mentioned before that techpinas is invited on a Nokia event to be held next week, and just now, i've found out that N8 is available for pre order. 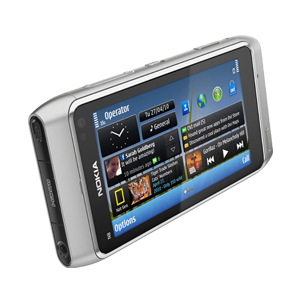 N8 is priced at around P 23,699.00 pesos with free 16 gb thumb drive from nokia. You will be asked which nokia store or authorized dealer you'll claim the handset. Sadly only silver white and dark grey variant are available for pre-order. I want the orange so I guess I'll just be trading it on the future. Reserve your units now! 23k is soooooo low. Sweet!! I wanna send you something. What's your active email address? Wow!!! Only 24k from the start ?!? PLUS a 16GB thumbdrive ?!? In my country, a few online stores have announced a price of around 32k (equivalent in php). That's outrageous! :( And we don't even have an availability date yet. I just hope by the time I will buy it (probably november or even december) the price will drop substantially. At least I will get a new firmware on it (hopefully), maybe with also the new web browser. yeah, you read it right mhen. And this is the first time in ph. 23.6k is definitely cheap that's why i get one even if no orange can be selected.